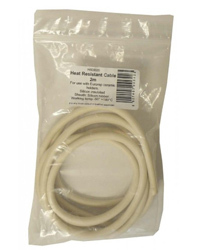 Heat Resistant Cable 2 metres in length for use with ceramic holders. This high temperature 3 core cable is silicon insulated and the sheath is made from silicon rubber. It has a working temperature of -50° to +180°C. When fitting always use a 3 amp plug and if in any doubt consult a qualified electrician.